Ashes are notoriously difficult to tell apart for the novice tree student. But they're nowhere near as hard as Willows! Ashes have compound opposite leaves. Their branches are very obviously opposite when viewed against the sky. The most common ashes are White Ash (Fraxinus americana) and Black Ash (Fraxinus nigra). These two species grow in entirely different environments, and their bark is quite different, so they're fairly easy to tell apart. See each tree's page for more details. 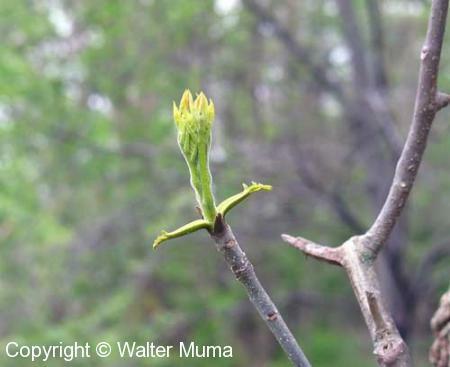 Please note: Green Ash and Red Ash (Fraxinus pennsylvanica) are now considered to be the same species. Here's a list of the Ashes that occur in Ontario, with some key identifying features. White Ash (Fraxinus americana) This photo shows the distinctive form of Ashes (in general) in the winter. Notice how the twigs are stout and obviously opposite. Maples are the group usually confused with Ashes in the winter. Their twigs are much less stout, almost scraggly. In fact, sometimes one has to search to find an obviously opposite pair. 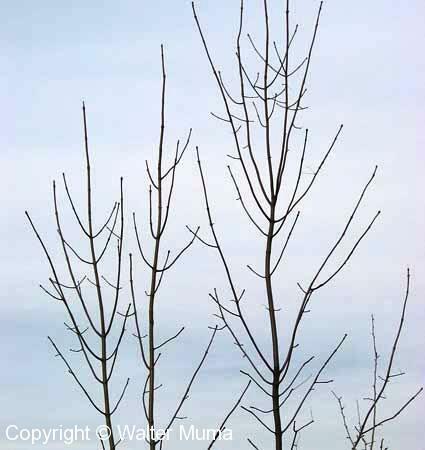 This is a White Ash (Fraxinus americana).